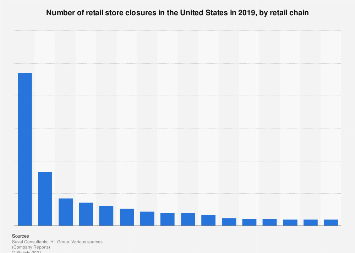 Massive store closures in the U.S., dubbed the retail apocalypse, are continuing in 2019. The biggest loss of brick-and-mortar retail announced so far will be the shuttering of all 2,500 Payless shoe stores following a bankruptcy filing. Gymboree Group will close all its locations of kids clothing stores Gymboree and Crazy 8. Charlotte Russe clothing stores are also to disappear while Family Dollar stores are partially closing, remaining open and being converted to Dollar Tree locations. With retail money moving online quickly, large department stores are also suffering. Sears made the top 10 in 2019 with 70 locations closing, but other brands like Kmart (50 locations), JCPenney (27 locations), Macy’s (9 locations), Kohl’s (4 locations) and Nordstrom (3 locations) are also shuttering stores. Retailers in the U.S. closed 102 million square feet in 2017 and a record 155 million square feet of space in 2018, according to the ranking by Business Insider. 2019 might bring about a new record. 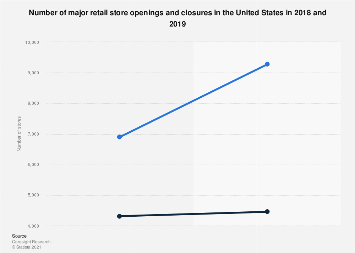 This chart shows which U.S. chains have announced the most store closures for 2019 (as of March 14, 2019).